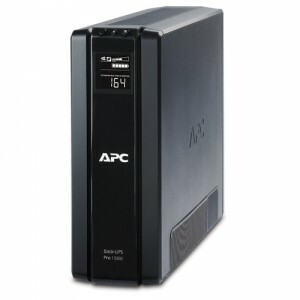 The APC Back-UPS Pro family offers guaranteed power protection for high performance computer systems, routers/modems, external storage devices, and other electronics in your business. These UPSs supply electronics with abundant battery backup during outages and stabilize unsafe voltage levels. They also provide power protection from damaging surges and spikes, and allow the use of management software so you get the most out of your UPS. Premium features of this family may include Automatic Voltage Regulation (AVR), an LCD display, Smart Outlets, energy saving functions that reduce electricity use, network manageability, Watchdog, or configurable outlets. Together with the rest of the Back-UPS Pro’s standard features, they are the perfect choice to protect your data and keep your system available. Energy Management Function – Energy saving feature automatically power off peripherals when the a master device, usually a PC, hibernates or is shut down. Power to peripherals is immediately restored when the master device wakes up or is switched on. LCD Status Display – Provides key UPS status at a glance. Multiple status indicators with load and battery bar graphs. Boost Automatic Voltage Regulation (AVR) – Preserves battery life and maximizes runtime by correcting low voltages without discharging the battery. For more about the Back-UPS Pro, call 800-876-9373 or email sales@power-solutions.com.